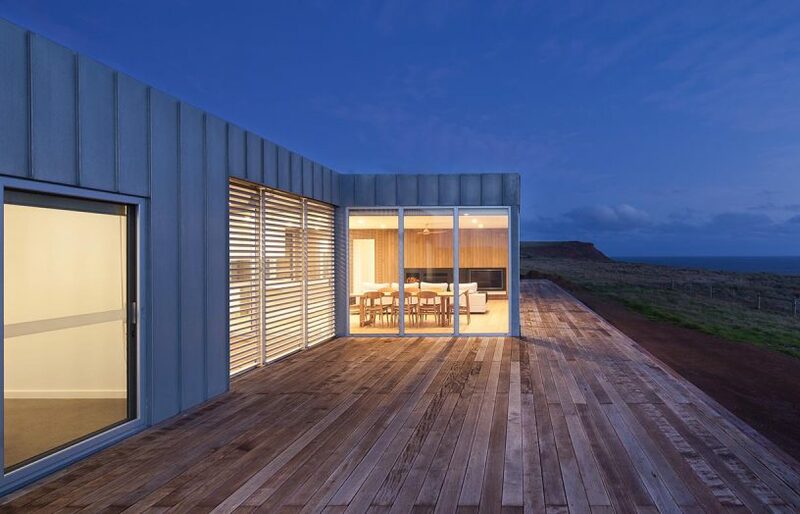 This lightweight prefabricated home was built offsite and delivered to its beautiful coastal setting via road and sea. The raking ceiling adds more volume and light to the intentionally compact space, designed to include just the bare necessities for a bush holiday. You don’t need much on a bush holiday. A view and a place to rest your head is often comfort enough when seeking a nature escape. With this in mind Adelaide’s C4 Architects have designed a modular and transportable house that measures just 90 square metres. The prototype SuperShak sits behind sand dunes at Vivonne Bay, a remote windswept settlement on South Australia’s Kangaroo Island. 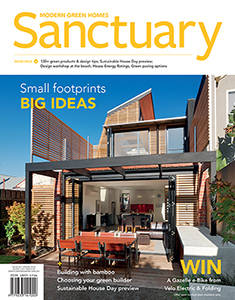 For architect Brent Dowsett sustainable design is about opening the house to nature. “Sustainability should mean more than just water and power usage, it’s primarily about enjoying the place that we live,” he says. “We wanted a house designed to intensify the relationship with the Australian bush.” The raking ceiling opens up a view to the sky via clerestory windows, while at eye-level the toughened-glass windows look out to a unique native coastal scrub environment. While the broad, angled roof gives the house its sky views and winter sun access, its slant also provides some protection from bushfires. It sits low on the north-west, the likely direction of a bushfire, with a large screen offering further protection on that side. The roof is extended for better rainwater catchment, with 20,000 litres of the 60,000 litre capacity set aside for firefighting. This house is designed to a fairly high Bushfire Attack Level, BAL 29*, but the kit of building materials can also meet the higher BAL 40 and BAL FZ ratings. 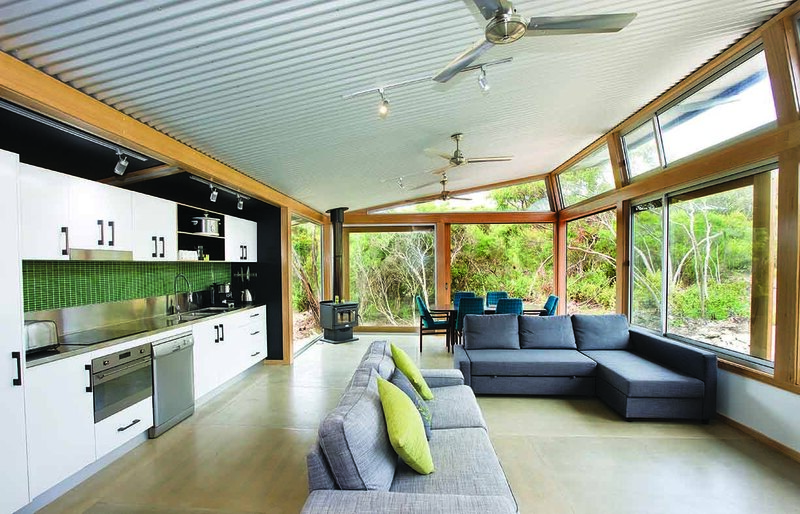 The fibre cement sheet floor looks like concrete and suits the wear and tear of a holiday house, but is also one of the more flameproof building materials around. 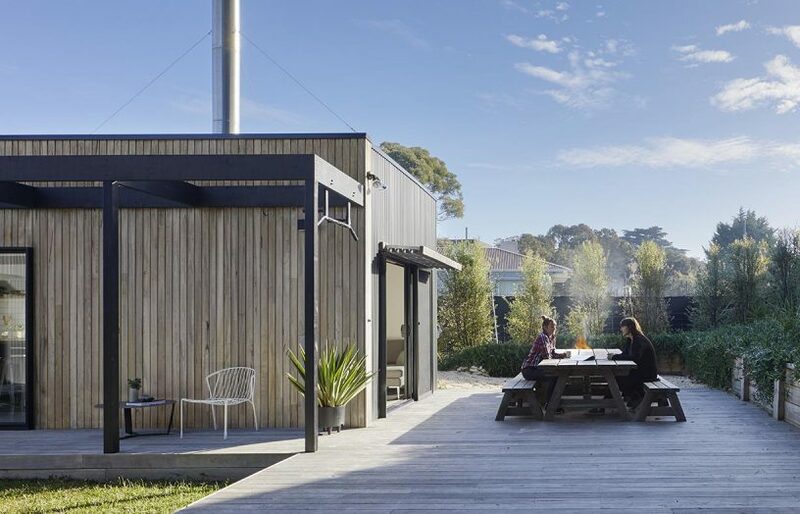 This prefabricated modular home is designed to be opened up to the great outdoors, be it a mountain setting or coastal views - or the local wildlife. 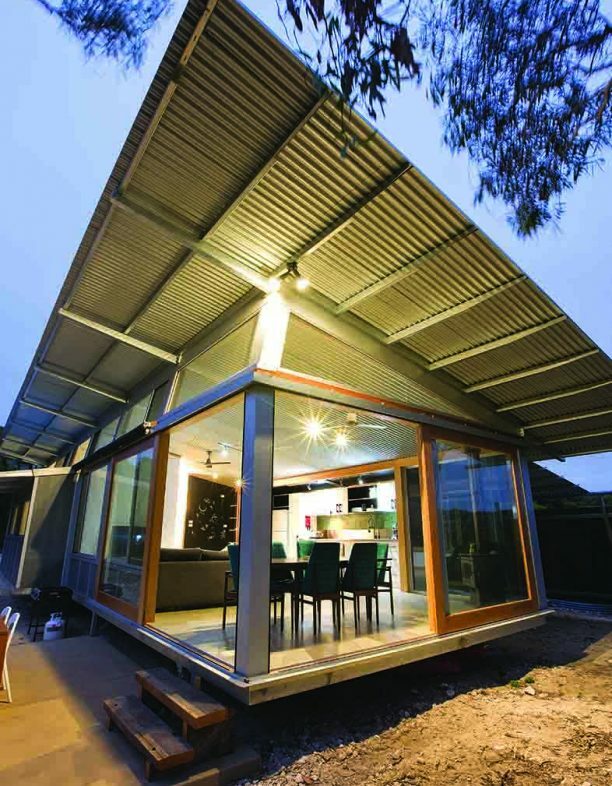 The broad, angled roof sits low on the north-west as a buffer against bushfires, with a screen for further protection. “The floor plan is kept small by including only the most important elements in a house,” says Brent. His premise is that holiday makers don’t need large bedrooms if they’re out enjoying the surf. There’s no need for space-eating wardrobes, with built-in drawers underneath the bed base and dedicated shelving and hanging space on the bedroom walls. 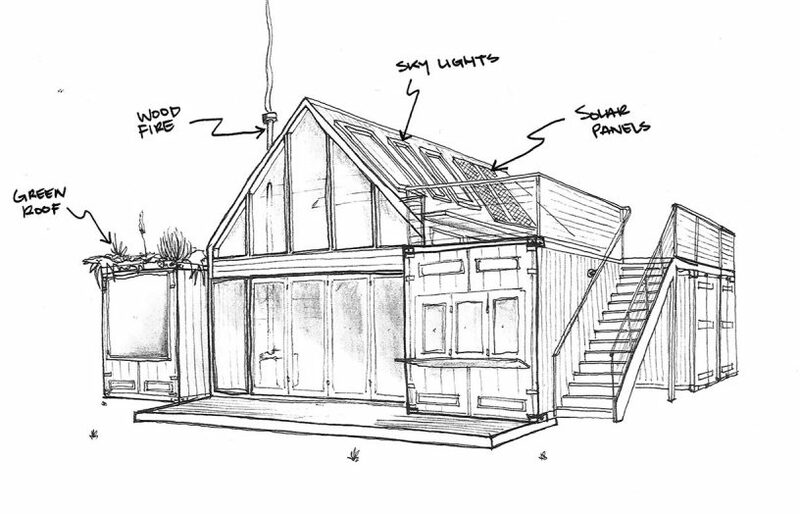 The modular prefabricated design saves materials and time when produced en masse. 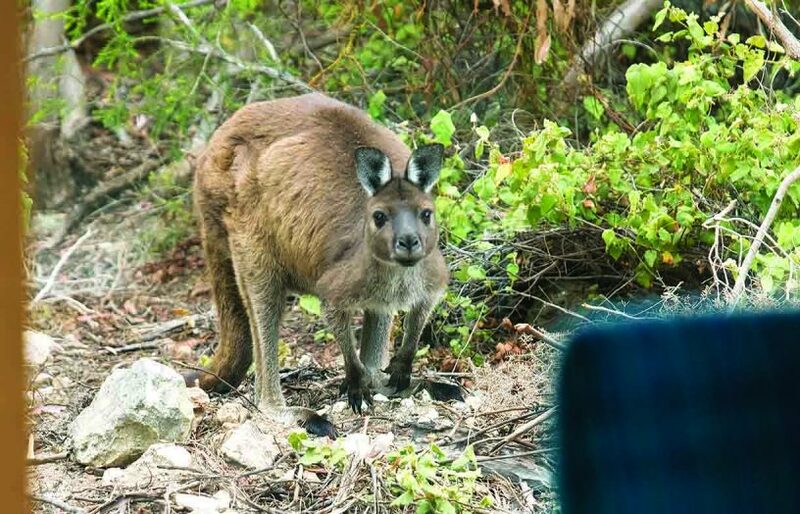 “It’s not just a one-off pretty shack in the bush,” says Brent. 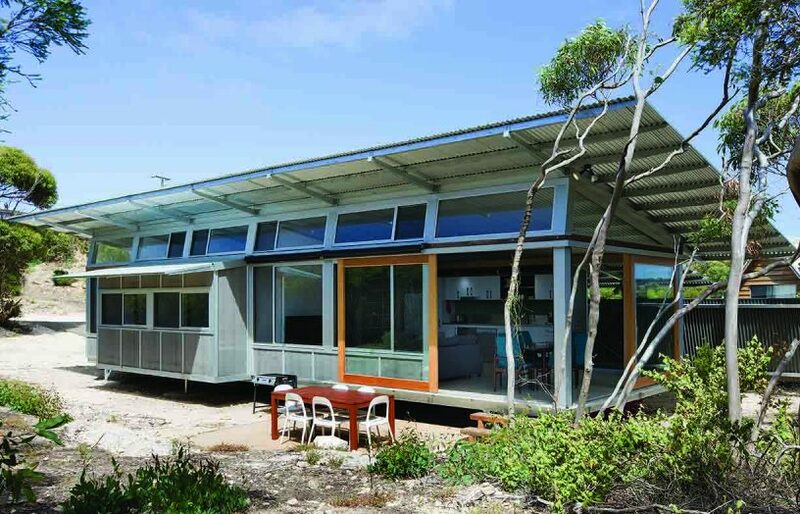 The home’s modules were built in the workshop of Brent’s regular builder, then delivered to the site on the back of a truck, including a ferry trip from the mainland. The layout is flexible and based around a rectangular main living area; its long thin shape lends itself to a warming north-facing orientation on any block to gain the winter sun, and ensures the hot western front is only narrow. The bedroom modules, however many are ordered, are bolted to the main rectangle onsite. They’re protected from the sun on the south side of this beach house, and benefit from cooling sea breezes on hot nights. * BALs range from BAL-Low, where no additional building elements are required, through to BAL-12.5 to BAL-FZ.